At 4 a.m. last Sunday morning, Fresno County, California resident Eric Gan heard a loud banging noise in his house. He lay awake in panic for an hour before falling back asleep, figuring he’d observe the damage in the morning. He didn’t expect to find five bullet holes in his home hours later. What he also didn’t expect was that his gaming monitor had stopped one of them mid-flight. What he most definitely didn’t expect is that the monitor still worked. Gan’s home, where he lives with roommates, had been punctured five times in the night, PC Gamer first reported after Gan posted about the incident on Twitter. Bullet holes marred the south wall. He didn’t know why, and chalks it up to some kids partying too hard nearby. “It’s kind of messy down here in Fresno, I guess,” Gan added. A public information officer from the Fresno County sheriff’s office corroborated Gan’s story with Kotaku. 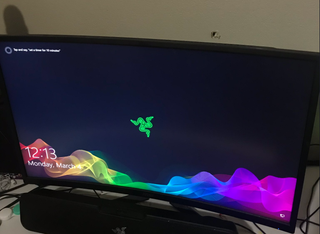 After posting about the shooting and his monitor’s incredible endurance on Twitter and Reddit, Gan received a message from the monitor’s manufacturer offering a replacement. Gan says that the day after the incident, he was playing Apex Legends again as if nothing had happened.